Bags, jackets, belts and suitcases, prices for these beauties start at just INR 800. So this store is for those of you have budget constraints. Leather fanatics, say hello to Thunderbird Leather Classics. 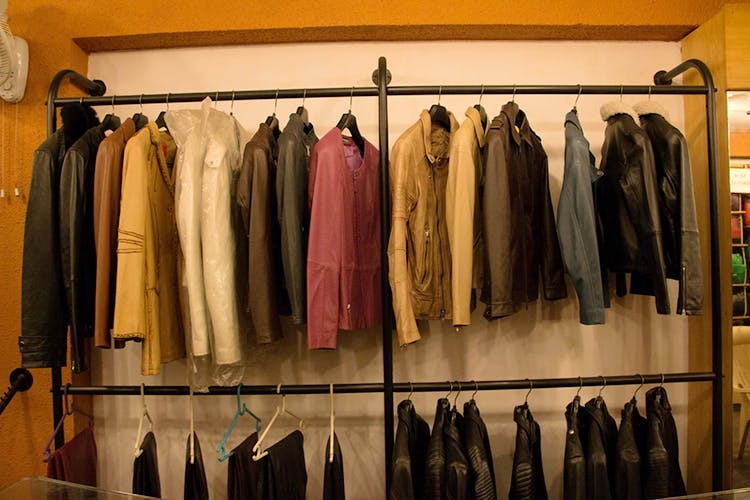 It’s the collection of leather jackets in all designs and colours that first got our attention. A closer look showed us that these jackets are available for both men and women, and feature some really cool designs. Bomber, biker, racing, you name it, these guys have them all. We spotted a few classic designs as well — the perfect motorcycle jacket in varying shades and the iconic Wolverine jacket. There’s plenty for the ladies too, all along the lines of the bomber, fitting, and racer styles. Prices for these start at INR 4,000 for men and INR 3,800 for women. Besides, ladies, who says you can’t rock the Wolverine jacket with skinny jeans and boots! Apart from the jackets, this store also stocks up on wallets, belts, handbags, laptop bags, and luggage. The collection of handbags is quite extensive, ladies. You will find regular handheld wallets, satchels, clutches, shoulder bags, and totes in the collection. Wallets for men feature the usual bi-fold and tri-fold styles along with cardholders and travel organisers. Unisex travel bags, messenger bags, and large shoulder bags complete the rest of the collection. The prices for these start at INR 800, with the handbags at an average price of INR 1,500. While the store claims to have a fixed rate, the shopkeeper did tell us that he can give us a discount.